Roan Mountain is not one mountain, but a five-mile ridgetop that ranges in elevation from a lofty 6,286 ft. at Roan High Knob to a low of 5,500 ft. at Carver’s Gap, near Bakersville. The Appalachian Trail crosses the grassy summits and affords wonderful panoramic mountain views during the ridgetop hike. 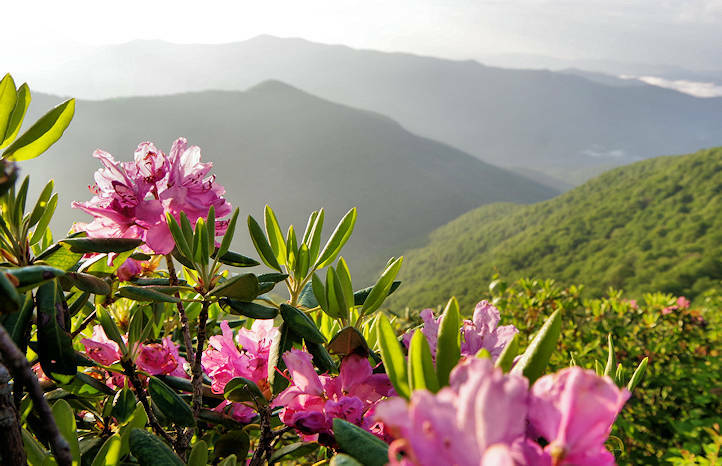 It's famous for the massive native Catawba Rhododendron display of blooms each June. The unique terrain also creates a rare and beautiful ecosystem. There are two distinct sections to explore Roan. 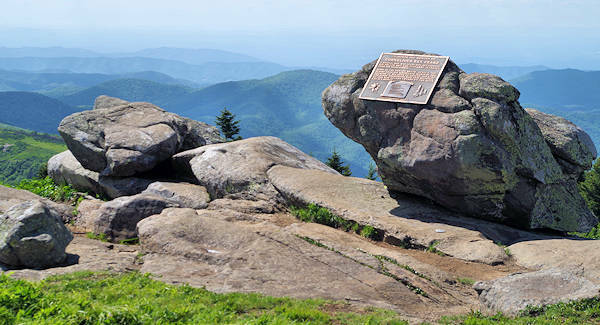 For the best hiking, park at Carver's Gap near the North Carolina / Tennessee state line and hike east (across the road) atop the grassy summits of Round Bald, Jane Bald and Grassy Ridge - five miles round-trip. 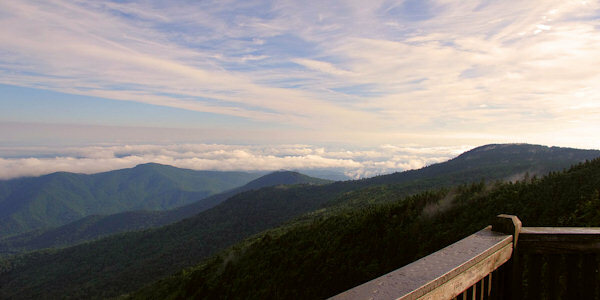 Or drive two miles from Carver's Gap into the Roan Mountain Recreation Area ($3/car, open summer months), part of Pisgah National Forest, for a picnic area, restrooms, paved half-mile trail through rhododendron gardens and a hike to Roan High Bluff overlook. This is definitely one of our favorite hikes in western North Carolina, and it's one of most spectacular sections of the Appalachian Trail! You can hike as little or as much as you like, and then turn around. It's only 3/4 mile to the first bald with spectacular vistas. 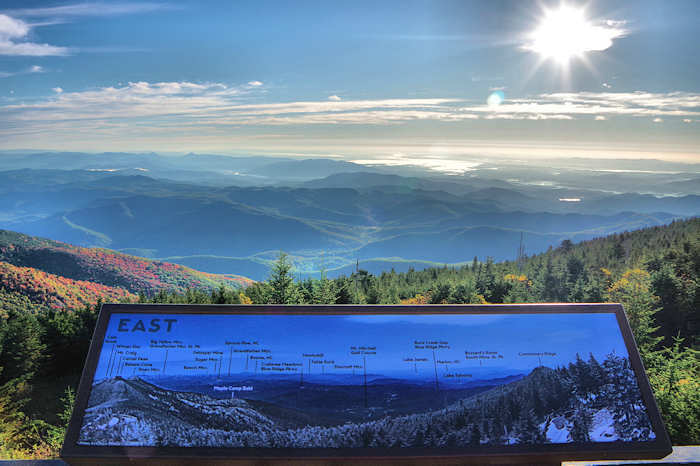 Go all the way to Grassy Ridge Bald for an unforgettable five-mile trek (with a total of about 1,200 ft. in elevation gain as you ascend and descend the balds). Read more below! 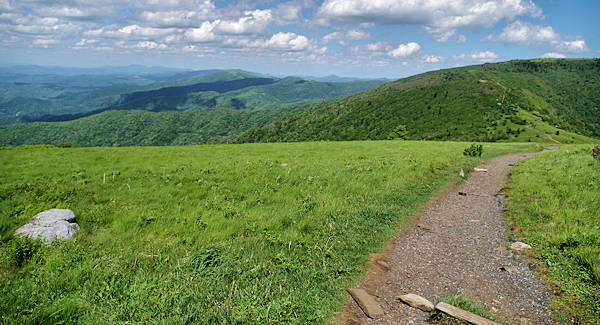 From the NC Highway 261 entrance to Roan Mountain Recreation Area at Carver's Gap on the North Carolina / Tennessee state line, it's a fairly easy uphill hike (300-ft. elevation gain) to Round Bald (5,826 ft.) for great panoramic views. The small parking area with a toilet is across the road from your starting point. The first part of the hike is through a good-smelling evergreen spruce forest. It's only 3/4 mile to the top of Round Bald - take a picnic or bring a book here to get away from it all! You can then return to your car or keep hiking. Since you are walking along the state border, views to your right are in North Carolina while views on the left are in Tennessee. To continue to the next summit, Jane Bald (elevation 5,807 ft.), hike another 3/4 mile downhill a little and then up. The entire section is across the grassy sections with quite a few rhododendrons and flame azaleas that both bloom in June. Again, it's a great spot for a picnic. You can turn around here for a 3-mile round-trip, or continue. 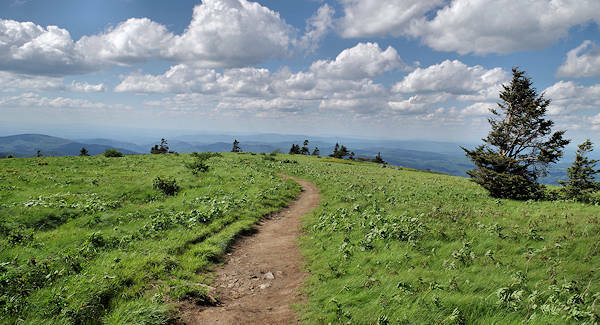 To reach our final destination, Grassy Ridge Bald (elevation 6,189 ft.), continue north on the Appalachian Trail downhill and then start another climb. In about In about 1/2 mile, the AT takes a left. A spur trail on the right takes you to the top of Grassy Ridge. It's a steep and somewhat rocky walk through a dense rhododendron tunnel. After you arrive back in the grasslands, look for the large rock at the summit. Atop Grassy Ridge, read the plaque in memory of local Roan advocate Cornelious Rex Peake. From the summit, you can take a loop to enjoy views in every direction. Look north for a great profile view of Grandfather Mountain. From Carver's Gap, go the other direction on the Appalachian Trail south 1.5 miles to Roan High Knob (more trees on this one) at the elevation of 6,285 ft. The Roan High Knob Shelter is the highest backcountry shelter on the entire AT. There are limited views on this section. 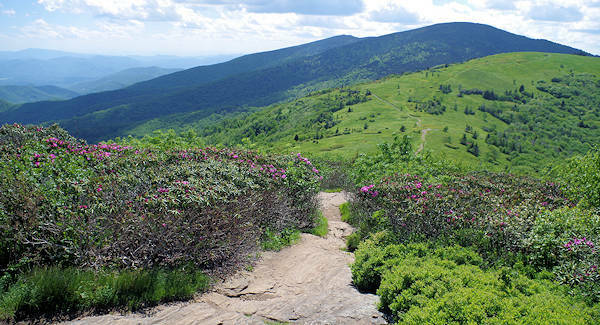 There are three hikes up the two-mile road into the Roan Mountain Recreation Area (turn at Carver's Gap). This area is open Memorial Day weekend through September. Admission is $3/vehicle. At the picnic area, an easy concrete trail starts at the information cabin and winds through rhododendrons to an overlook. You can choose between a short, 0.3-mile loop or continue on a longer, figure-eight loop. The Cloudland Trail is a moderate, 1.2-mile hike through a gorgeous forest from the end of the Cloudland parking area to the dramatic Roan High Bluff Overlook. The 1000-ft. drop can make this spot the wettest and coldest on the mountain. You can drive out farther (to the end of the loop) and catch the trail for only a half-mile hike to the Bluff. No one knows the origin of the mountain’s name. 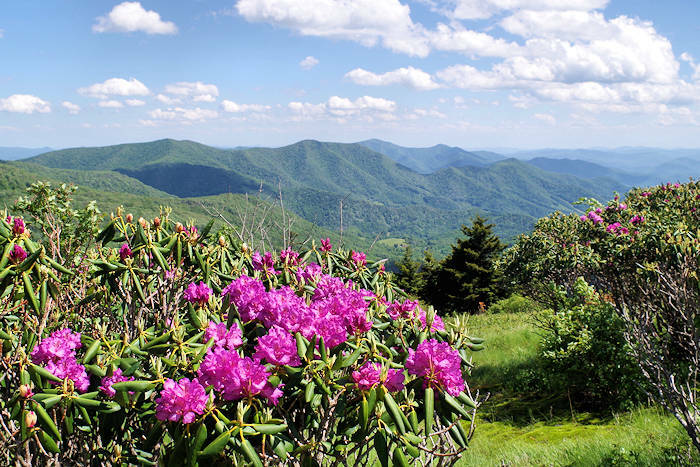 Some claim the name refers to the roan or reddish color of the mountain when rhododendrons bloom in June or the mountain ash berries appear in September. Others say the name comes from Daniel Boone’s roan horse because he and his horse were frequent visitors. The Carver's Gap parking area is open year-round (receives a lot of snow each winter).You can walk or cross country ski into that area all winter. 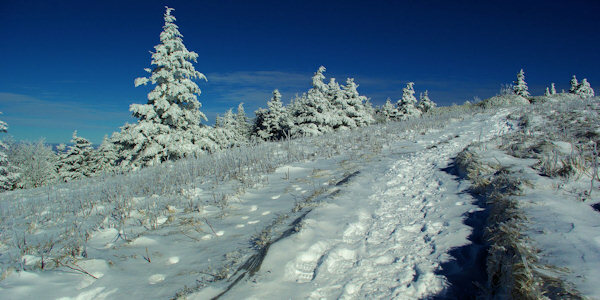 See photos of a spectacular winter hike on Roan. The summits are always cooler (sometimes 15-20 degrees colder than 13 miles downhill in Bakersville), especially if covered in clouds. The winter is long with a lot of snow. Bring a jacket even on summer days. Beware! The weather can be much cooler here and change quickly. So be prepared. And this is not a good place to be during a thunderstorm! Clouds often cover the summits and high winds often blow across the balds. (allow 1.5 hours) There are several ways to get to Roan Mountain. It's about 13 miles north of Bakersville, NC on Highway 261. Be ready for curvy, mountain roads.